About eight-in-ten Americans (83%) identify ultraviolet as the type of radiation that sunscreen protects against. Nearly as many (77%) know that the main concern about the overuse of antibiotics is that it can lead to antibiotic-resistant bacteria. However, only about half (51%) of the public knows that “fracking” is a process that extracts natural gas, not coal, diamonds or silicon from the earth. Similarly, knowledge of basic scientific concepts differs greatly across questions. While most Americans (78%) know that the basic function of red blood cells is to carry oxygen to all parts of the body, just 20% could identify nitrogen as the gas that makes up most of the atmosphere. The quiz is part of a nationwide survey, conducted March 7-10 among 1,006 adults, which also probed opinions and perceptions about science and math in education. The survey was conducted with Smithsonian magazine for an edition focusing on STEM (science, technology, engineering and mathematics) education (see “How Much Do Americans Know about Science?”). The public underestimates how well American high school students perform on standardized science tests compared with students in other developed nations. A plurality (44%) believes that 15-year-olds in other developed nations outrank U.S. students in knowledge of science; according to an international student assessment, U.S. 15-year-olds are in the middle ranks of developed nations in science knowledge. Nearly half of Americans (46%) say that the main reason that many young people do not pursue degrees in math and science is mostly because they think these subjects are too hard; just 22% say it is mostly because young people think math and science are not useful for their careers while 20% say it is because they think these subjects are too boring. Women (54%) are more likely than men (37%) to say that the main reason young people do not pursue math and science degrees is because they think these subjects are too difficult. The new survey includes a mix of 13 knowledge questions; some are the type that might be found in a science textbook while others come from news coverage of science and technology issues. Among the textbook-type questions, the quiz asks which is a chemical reaction – water boiling, sugar dissolving or nails rusting. Two-thirds (66%) correctly say that nails rusting is an example of a chemical reaction; much smaller percentages incorrectly say that water boiling (12%) and sugar dissolving (also 12%) are examples of chemical reactions. 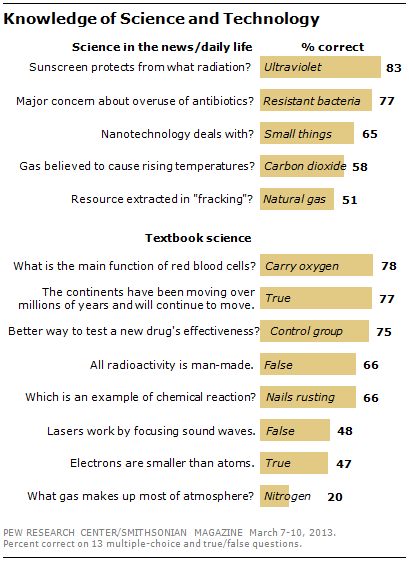 The survey also asks about basic scientific knowledge in a series of true-false questions. Most Americans (77%) correctly say it is true that the continents have been moving for millions of years and will continue to move in the future. 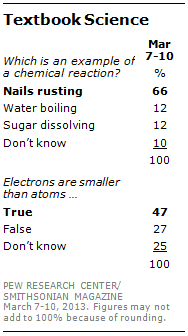 But only about half (47%) say it is true that electrons are smaller than atoms. 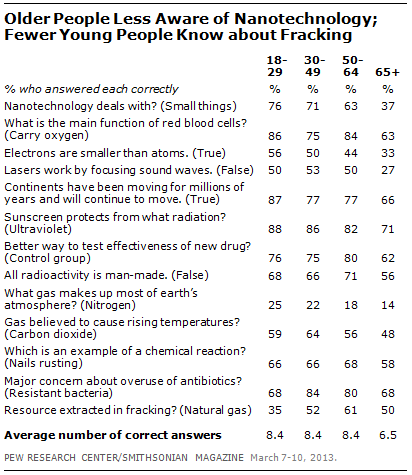 The percentages answering these and other true-false questions correctly are little changed from a June 2009 survey. Other questions test knowledge of scientific methods and current scientific issues. 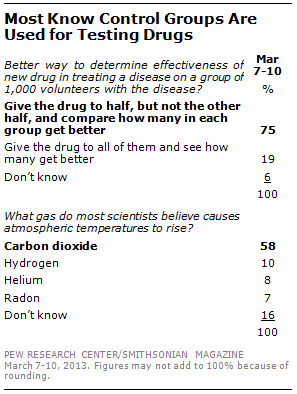 Most Americans know that scientists use control groups to test the effectiveness of new drugs in treating disease. Three-quarters (75%) correctly say that scientists give a new drug to half of a group of volunteers, but not to the other half, and compare how many in each group get better. Just 19% say it would be more effective to give the drug to the entire group. Education is the strongest demographic predictor of knowledge about science and technology. People with at least some exposure to college do much better than those with no college experience on nearly all of the questions. On several questions, there also are wide differences between college graduates and those who have attended college but not graduated. For instance, 76% of college graduates but just 55% of those with some college experience identify carbon dioxide as the gas that most scientists believe causes atmospheric temperatures to rise. There are only modest partisan differences in knowledge about which gas is generally seen by scientists as causing atmospheric temperatures to rise; 63% of independents say it is carbon dioxide, as do 58% of Republicans and 56% of Democrats. 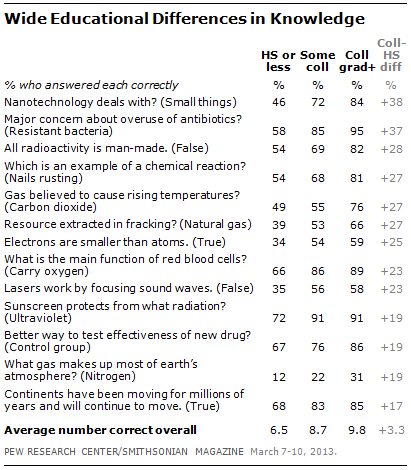 Notably, even most college graduates could not identify the gas that makes up most of the earth’s atmosphere. Just 31% correctly say it is nitrogen, while an identical percentage (31%) incorrectly says it is oxygen. Among those with a high school education or less, oxygen is the most frequent response. In previous Pew Research Center surveys measuring knowledge of politics and public affairs, young people typically have not fared as well as older people. But that pattern does not hold for most questions about scientific topics. As a group, those younger than 30 do about as well as those in the 30-49 and 50-64 age groups. Meanwhile, people 65 and older scored relatively low on many questions. Just 37% know that nanotechnology deals with small things; majorities in younger age groups know this. And just 27% correctly answered a question about how lasers work, compared with about half in older age groups. However, half (50%) of those 65 and older identify natural gas as the resource extracted in fracking, compared with 61% of those 50-64, 52% of those 30-49 and just 35% of those under 30. This was the only question on which those 65 and older scored higher than those younger than 30. Overall, men outperformed women on the quiz, though in many cases the differences are modest. On average, men answered 8.6 items correctly, compared with 7.7 items for women. 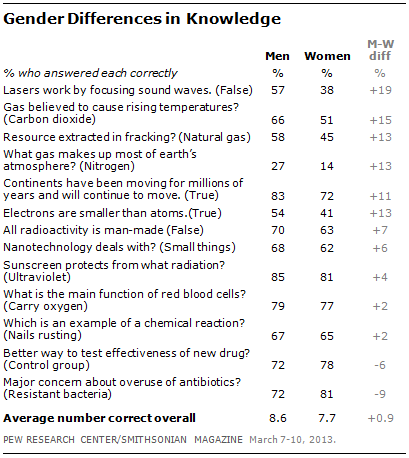 On the health-related questions on the quiz, however, women did as well as or better than men. Women are more likely than men to know that a major concern of the overuse of antibiotics is that it can lead to antibiotic-resistant bacteria (81% of women know this vs. 72% of men). What Subject Should Receive More Emphasis in K-12 Schools? Asked in an open-ended format what one subject being taught in K-12 schools should receive greater emphasis than it does now, 30% volunteer math and arithmetic. About one-in-five (19%) say English, grammar, writing and reading should receive more emphasis, while about one-in-ten cite science (11%) or history (10%). Republicans (35%) are more likely than Democrats (24%) to say that math and arithmetic should be emphasized more by schools. 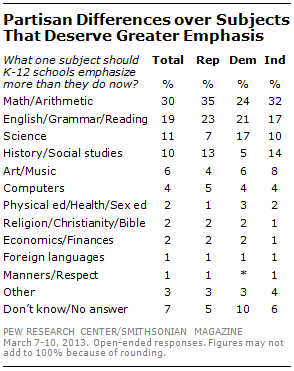 More Republicans (13%) than Democrats (5%) also say that history, social studies and civics should get greater attention. By contrast, while 17% of Democrats say that science should receive greater emphasis in K-12 schools, just 7% of Republicans agree. Comparable percentages of Republicans and Democrats say other subjects – including English and grammar, art and music, and religion and Christianity – deserve more emphasis than they are currently receiving. 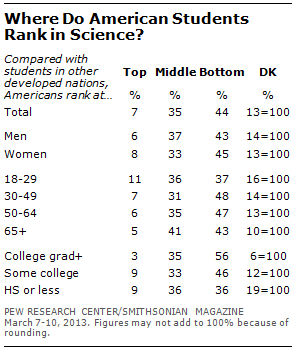 A plurality of Americans (44%) say that average American 15-year-olds rank at the bottom on standardized tests of science knowledge, when compared with students in other developed nations. That is incorrect: According to the most recent available data from the Program for International Student Assessment, U.S. students rank among the middle of OECD nations. College graduates are more likely than those with less education to underestimate the performance of U.S. teens on standardized science tests. More than half of college graduates (56%) say that American students rank near the bottom among developed countries. That compares with 46% of those with some college experience who do not have a degree and 36% of those with no more than a high school education. There are no significant partisan differences in evaluations of student performance on standardized science tests: 46% of Republicans and about as many Democrats (45%) and independents (45%) say they rank near the bottom among developed nations. 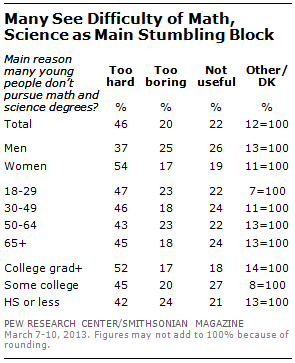 When asked why many young people do not pursue degrees in math and science, a 46% plurality says it is mostly because they view these subjects as too difficult. Fewer say young people are turned off because they see math and science as not useful for their careers (22%) or because they are too boring (20%). Young people have about the same opinions as older people for why many do not pursue math and science degrees: 47% say it is because those subjects are seen as too difficult. More women (54%) than men (37%) say many young people do not go after degrees in math and science mainly because they perceive those subjects as being too difficult.